Migratory animals live in locales that are difficult to survive in year-round. Instead of hibernating (the survival choice of many land animals) when food and water become scarce, these animals choose to migrate in search of more hospitable habitats and terrain. Most land animals practice seasonal migration -- a type of migration that corresponds with the change in seasons, while others migrate in search of mates. Zebras (Equus burchellii) are active participants in what researchers call “The Great Migration.” This migration occurs when over a million wildebeest, zebras and other grazing animals migrate towards water and grazing land during the dry season in eastern Africa. Zebras form tight knit family units, which consist of one male, several females and their young; however, zebra units often combine with other herds (of both zebra and other species) during the migratory process. These black and white-striped herbivores seem to know safety comes in numbers. Wildebeest are also part of Africa’s great migration. Several subspecies of wildebeest (part of the antelope family and also referred to as “gnu”) inhabit the plains and acacia savanna in eastern Africa. Large herds, in the hundreds of thousands, of wildebeest make a migratory circle 500 to 1,000 miles wide each year during the dry season in search of water and grazing lands. Their journey begins in the southeastern Serengeti plains when the rains end in April, May and June, moves west towards Lake Victoria then north into the Maasai Mara National Reserve in September and October. 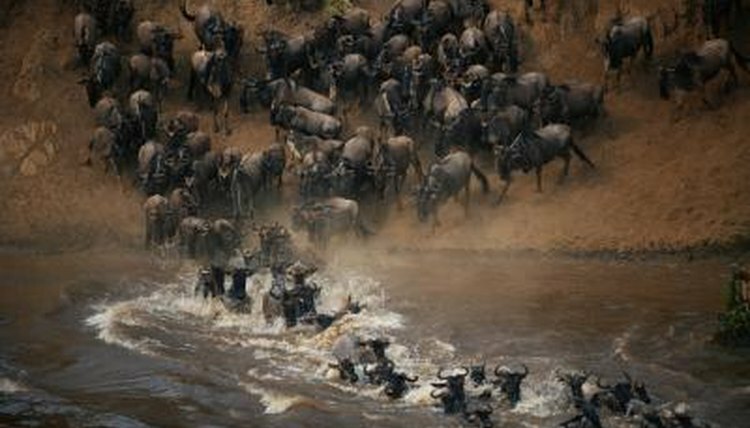 A wildebeest’s migratory journey is perilous with predators such as lions constantly stalking the large, exposed herds. The largest land animal on earth, the African elephant (Loxodonta africana), migrates in order to breed. Every year in April, male African elephants begin migrating southward in search of female herds to mate with. The entire migratory loop spans roughly 100 miles. During this time male African elephants gain energy from a frenzied increase in levels of testosterone called “musth,” which signals the beginning of his active mating season. Their migratory journey and mating season ends in June. American bison (Bison bison) inhabit the grasslands and parklands of Canada and the central United States. They are nomadic as well as seasonal migratory animals. During the day, bison slowly graze on grasses, herbs and shrubs, moving approximately 2 miles each day; this slow-moving migratory pattern is called “nomadic migration." During their seasonal migration, American bison move to more southerly habitats in the winter covering up to 150 miles during their journey.